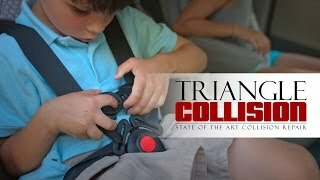 Triangle Collision is a Ford Body Shop serving the Cary, NC area. We deliver factory-approved repairs for all Ford cars, trucks and SUVs. We offer a hassle free repair experience. We have on-site paint services and will help you handle your insurance claim. Our goal is to get your Ford back on the road in pre-accident condition. We stand behind our collision repair with Lifetime Warranties for many of our services. Our goal is to protect your investment, and keep your Ford driving with the performance and safety that you have come to expect. Our customer relationships are built on trust. We are always open with our customers because we are only interested in providing high quality repairs. Other body shops are often trying to cycle through as many vehicles as possible. We understand that proper repairs cannot be done this way. We follow strict factory guidelines that guarantee a complete and safe repair. Your Ford is crafted to be durable, so it is important to inspect the vehicle for full damages after a collision. This way you can get back on the road in a vehicle that performs just as it did before the accident. It’s your choice, not the insurance companies, where your vehicle is repaired. Choose Triangle Collision, the Cary, NC area’s premiere Honda Certified Body Shop & Collision Center. Modern Ford designs require the expertise of a highly educated technician to repair. Ford vehicles have very specifically laid out procedures for how their vehicles should be put together and repaired. These procedures ensure that the quality of their performance and safety features function as they are supposed to. Not every shop has the training or the equipment required to follow these procedures. However Triangle Collision has gone the extra mile to train our technicians and keep our repair center up to date with modern collision repair. We use BASF technologies for our paint and refinishing services. BASF is the industry standard for paint and refinishing and is guaranteed to perfectly match your Ford’s original color. We have partnered with Lemon’s Wrecker Service, a family owned and operated towing service. This gives our customers access to 24/7 towing that can be included in the total cost of repair. This makes it easier to cover in the insurance claim. Let us take the stress of dealing with the insurance company off of your hands. We understand the claims process and will work with the insurance company to get your vehicle back to pre-accident condition. Modern Ford vehicles have very purposefully designed safety features. Certain components are designed to crumple easily, while others are built to remain rigid in an impact. Sensors tell the vehicle the exact moment to release the airbags and how to restrict the seatbelt to most optimally protect the passengers. These systems are incredibly advanced and save lives. However they need to be carefully repaired after a collision in order to make sure they work in the event of future collisions. Even if the airbags were not deployed, damages to a seemingly unrelated component could affect the way the airbags systems react. By following the strict guidelines set by Ford, our technicians ensure that all of your safety systems are functioning perfectly after our repairs.